More maps, including printable ones, are available here. You are invited to the Friends of the Goffstown Rail Trail meetings on the Fourth Tuesday each month, 7:00 pm (January - November) at the Parks & Rec Center on Mast Road (Google map link). The 2018 - New Hampshire Recreational Trail Program (RTP) Grant 18 – 25 (East Union St. to Shirley Park) project has been completed. The 1,800 feet of trail has now been improved to meet town specifications and an additional 17 feet of split rail fence have been added by volunteers. Funds from the RTP award, FGRT donations (including those from the Manchester Marathon Association), membership fees and donations from trail users were used to complete this project. Check out the Trail Information Kiosk that is fully operational at the Mast Road Parking Area. It was constructed by two Girl Scouts, Victoria and Jillian from Goffstown Troop 20841, as their Silver Award Project. Built to meet the Friends of the Goffstown Rail Trail specifications; the Girl Scouts created a comprehensive business plan that included the funding, purchase of material, construction and final on-site assembly. First, the plan was presented for review and endorsement by the Goffstown Parks and Recreation Commission, after which the donation of the kiosk as an improvement to town property was approved by the Board of Selectman. It's that time of year to renew your membership or join the 2018 Friends of the Goffstown Rail Trail. In 2016 funds went to the upgrading of the trail surface at the Manchester / Goffstown line, the improvement of the trail with compact gravel under the power lines near the intersection of Greer Road and Route 114 and much, much more. Please go to our membership page. The Board of Directors of the Manchester Marathon Association identified the Friends of the Goffstown Rail Trail (FGRT) as a recipient of their charitable giving program. They recognize the health and fitness benefits that FGRT provides to the Goffstown community. At the February 28th trail meeting, Larry Gagnon - Chair of the Manchester Marathon Association presented a donation of $2,500 to Warren Denby – President of FGRT and David Pierce -Treasurer of FGRT. The donation will help FGRT develop the trail and match funds raised from various federal, state and other grants. 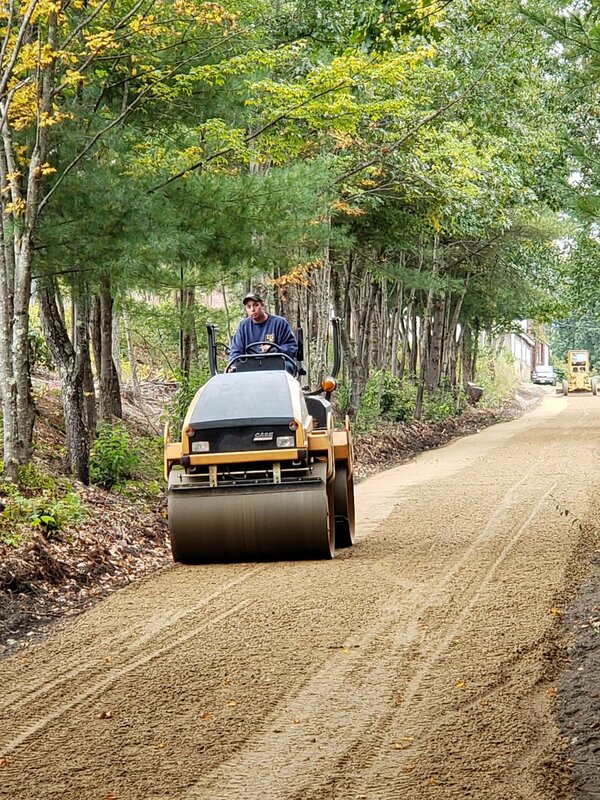 Thank you for your care and caution during the reshaping and compacting of the trail on the Goffstown Rail Trail near the end of the Piscataquog Trail. The next step will be to add the 'nitpack' gravel to meet the town trail specifications. A Goffstown Rail Trail video is now available that provides some brief history and trail feature descriptions. Watch it here. Have you been out on the trail and seen a tree down, trail damage, or some other issue? Submit a Trail Report via email or this form. The Goffstown Board of Selectmen have accepted the donation of material and labor from the Friends of Goffstown Rail Trail. Our Volunteer Work Crew has been replacing the soft sand on the trail under the power lines near Route 114 and the intersection of Greer Road. A 4 ft. wide path of hard nitpack gravel has been installed to enable easy passage of bicycles and pedestrians.